We offer a radically common sense approach to training and development for your people; an approach based on the latest scientific research and our experience of delivering hundreds of training programs to bring about performance improvement. We know it is human behaviour that drives results and if you need to improve results, you need to change what people are doing. Our expertise is to understand what behaviour will drive the right result, understand the current behaviours and what is driving them and then create a training and development learning programme that will shift the behaviour. We are in the business of helping organisations get the very best from their employees. At Alive & Kicking Solutions we follow a tried and proven approach that we have been perfecting since 1998. Phase 1 – We take time to understand your business, your culture and your specific needs. Phase 2 – We design learning strategies incorporating customised training and development, coaching and behavioural profiling to create behaviour change and improved performance. Phase 3 – We feedback and support to enable you to get maximum return on your training investment. All of our programs are designed to be highly interactive and full of energy. We use experiential learning techniques, a lot of multi-layered games, and activities to drive key business or content messages. 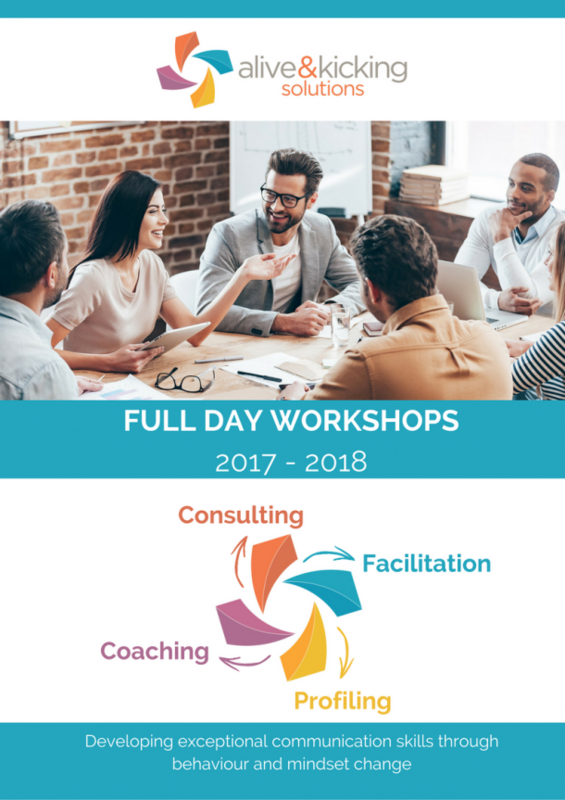 Our facilitators are expertly trained communicators who are able to deliver training in a way that is highly engaging and delivers the outcomes needed. Getting busy people in the workplace to press the pause button long enough to want to engage in training and get actively involved, is our expertise. How? We emotionally engage people, make the need for training real to them, speak their language, tailor it to their needs, excite them, involve them, listen to them and use interactive learning experiences that carry powerful messages that invoke thought change. Then, continuing with a practical application to their thoughts, this is what we are renowned for. The transference and application of thought is a major part of what makes real results happen through training. A place where employees are happy to come to work, a place where customers enjoy being served and where leaders inspire. That’s an Alive & Kicking company! Get our latest training brochure! The brochure contacins a selection of our most popular programs. Thank you, the brochure will arrive in your in box shortly.